SAN FRANCISCO, CA – (KRON) – Doctors are stunned after a man coughed up a blood clot so large it came out in the exact shape of his right lung. According to the New England Journal of Medicine, the 36-year-old man was initially admitted into intensive care at UC San Francisco Medical Center for heart failure. Doctors say it was at this time he experienced “an extreme bout of coughing” and coughed up a 6-inch wide blood clot of his right bronchial tree. The man died a week later. “The patient was extubated 2 days later and had no further episodes of hemoptysis,” or coughing up blood, the author of the study wrote. Officials say the man had previously been outfitted with a pacemaker and was receiving additional treatment at UCSF. It may be possible that the man’s prescribed blood thinning medication helped to create the bright red clot. Apparently the man had been coughing up much smaller clots days before the big one came out, according to The Atlantic. Doctors say this is rare but not entirely groundbreaking. In 2005, the European Journal of Cardio-Thoracic Surgery wrote about a pregnant 25-year-old woman who had developed a disorder affecting her clotting agents, which led to the woman coughing up a smaller bronchial-tree cast. 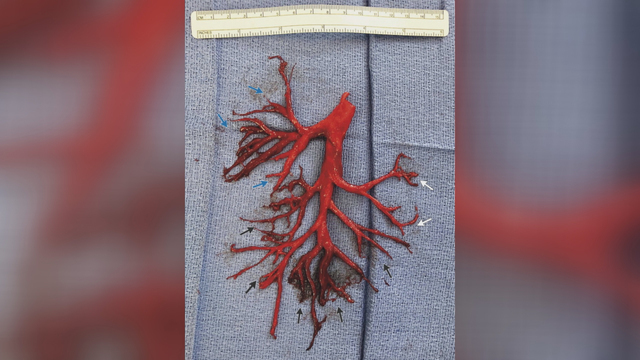 Gavitt Woodard, a clinical fellow in UCSF’s thoracic-surgery department who helped UCSF transplant and pulmonary surgeon Georg Wieselthaler take the photo, says the size of the clot itself may have been what allowed the man to cough it up.